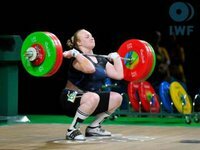 Ukrainian weightlifter Anastasia Lysenko has won a silver medal at the European Weightlifting Championships in Split (Croatia). Lysenko lifted a total of 277 kg in the weight category up to 90 kg. Russian sportswoman Tatyana Kashirina took gold medal of the championship in the category up to 90 kg. A representative of Hungary Krisztina Magat took the bronze medal.